While Robots In Disguise cartoon and toyline are finished, some more RID merchandising is still surfacing around. 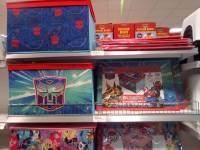 Thanks to 2005 Boards member Underlord we can report a nice Robots In Disguise storage chest that has been found at UK retail. 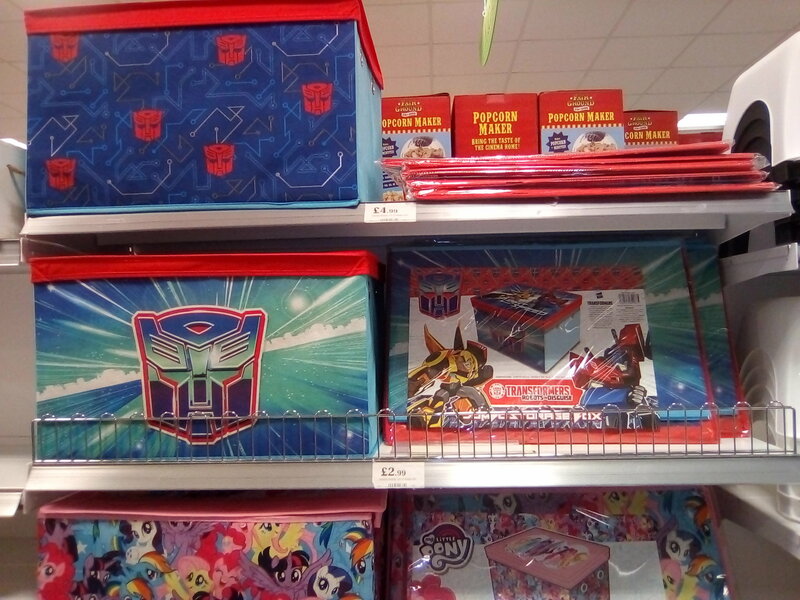 This a quite big box featuring a big Autobot insignia and some more similar decoration over it. It was found at Home Bargains in Clacton for £4.99. I saw these in my HB about a month ago, but wasn't enthused enough to report it anywhere. As usual though, if it had been G1-themed I'd have been all over it. Wowzers! Can't believe it. In my local H&M store! Totally first worldwide sighting of what could be the first TF: BB MOVIE merchandise (notice the different head shape?). Let us speculate what the OP mask hidden behind looks like until we get clear pics! I'm sure this is worth frontpaging too. Yes, it's a cheap-and-cheerful fold-out storage box that might, just might mind you, be useful for parents to put their kid's Transformers toys into. But hey, you lot go right ahead and carry on moaning. It's for kids to store their toys. Looks like it has no NuRiD characters printed on it at all, Optimus and Bee are only on card insert under the foil. I would have loved to have one of these as a kid! I had to stash my TFs in a shallow plastic bin with no lid. It got pretty cumbersome and crowded, especially when I got some of the bigger figures. I don't want to sound negative, but what is the point of frontpaging such incredible news? Long dry season before NY Toy Fair? If one has a mod from his coutry, every spotted pencil case with a TF logo gets frontpaged. Or a TF figure that's been out and reported from a minor country months before is frontpaged because it was spotted in the "right" country. Hey, I'd probably want this if I wanted to store away my figures. And why not do it in style too. I would totally go after a G1 inspired sturdy storage box. I saw that in the Stirling branch earlier. I didn't realise it was a new thing! What is this? 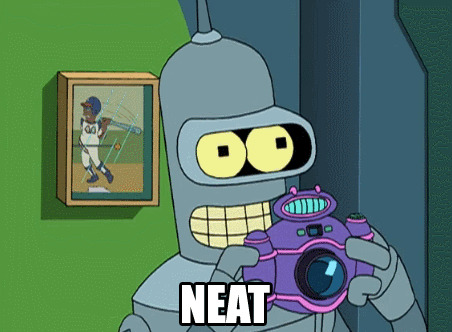 Just… an empty box with RID characters on it? Found this for £4.99 in Home Bargains in Clacton.